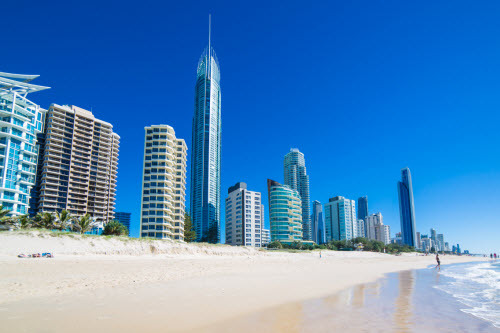 Discover cheap holiday packages to the Gold Coast from New Zealand. Home to 52km of pristine sand, epic surf breaks and 300 sunny days a year, this part of the Australian coastline is one its most popular destinations. With a non-stop flight time of 3 to 4 hours from New Zealand, it's perfect for weekend trips or longer holiday breaks. Don't spend hours researching flights and hotels. Take the stress out of planning your next trip by purchasing a flight and hotel combo deal. Browse Webjet's exclusive holiday package deals that include affordable flights to the Gold Coast and accommodation for the duration of your trip. All you need to do is select the best holiday package deal that suits your budget and needs. With its family-friendly attractions, pristine beaches and wealth of natural attractions, this south-east Queensland destination is a holiday hot spot. One of the biggest draw cards for New Zealanders to the Gold Coast is the sunshine. If you need a break from the rain, clear blue skies and warm weather are only a short flight away. Another reason so many Kiwis flock here is the direct flights. With airlines offering non-stop flights from Auckland, Christchurch, Wellington and Queenstown, it's possible to catch a flight in the morning and be working on your tan by the afternoon. The city's most famous area is Surfer's Paradise. Students flock here for freshers week to enjoy the beach, go surfing and party it up at at the stylish pubs, clubs and lounge bars. While the Gold Coast is known as a party destination, it's also a family favourite thanks to its Movieworld and Wet 'n Wild theme parks. While it's not the cheapest activity, if you plan ahead you can pick up special passes and deals for unlimited visits to the parks. The only downside to the Gold Coast is the cost of accommodation. If you don't want to stay too far away from all the action, pick up a Gold Coast holiday package deal and save more by combining your flight and hotel together. 5. Weather: The best time to visit the Gold Coast for a tranquil getaway is from April to May. There is little chance of rain, comfortable temperatures and no school holidays. But if you're wanting more action during your stay, the party months are September to November, when the new grads arrive for Schoolies Week. 6. Getting Around: If you want to hire a car while in the Gold Coast, all you'll need is your current New Zealand driver's licence. 7. Drinking Water: The tap water in the Gold Coast is safe to drink. 8. Safety: If you plan on going swimming in the ocean, make sure you stay safe. Always swim where there are lifeguards and stay between the red and yellow flags.